June existing-home sales declined 1.8 percent to a seasonally adjusted annual rate (SAAR) of 5.52 million -- down from 5.62 million in May. In May, “consumer resilience” was enough to keep existing-home sales afloat, but sheer willpower failed to offset the effect of low inventory on the market in June. 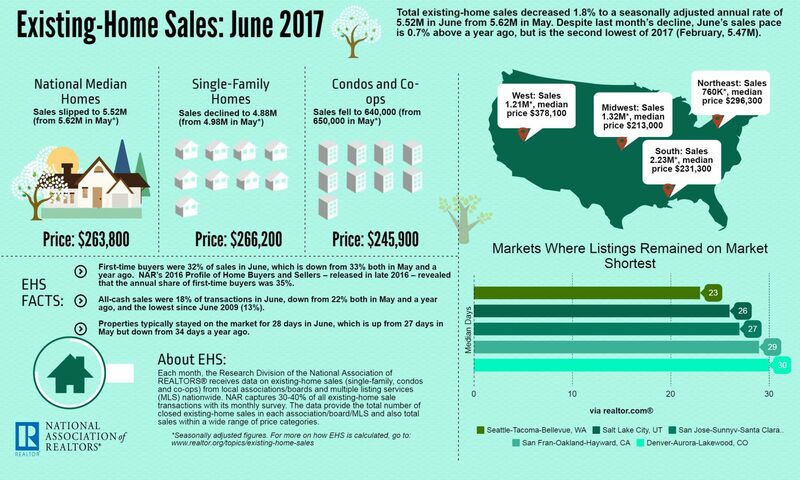 The National Association of Realtors’ existing-home sales dipped 1.8 percent to a seasonally adjusted annual rate (SAAR) of 5.52 million in June — down from 5.62 million in May. This month’s sales pace is 0.7 percentage points above June 2016 and is the second lowest SAAR sales pace of 2017. The median existing-home price for all housing types in June rose 6.5 percentage points to $263,800, which marks the 64th consecutive month of year-over-year gains. Total housing inventory dropped 0.5 percentage points month-over-month to 1.96 million homes for sale. Year-over-year inventory declined 7.1 percentage points and is 25th consecutive month of year-over-year declines. Unsold inventory is at a 4.3-month supply, a 0.3 percent year-over-year decline. NAR Chief Economist Lawrence Yun says the month’s existing-home sales is due to a lull in contract activity over the past three months. “Closings were down in most of the country last month because interested buyers are being tripped up by supply that remains stuck at a meager level and price growth that’s straining their budget,” Yun said. Distressed sales, which include foreclosures and short sales, were at 4 percent — a 1 percentage point drop from May and 2 percentage points lower than June 2016. Three percent of June sales were foreclosures, and 1 percent were short sales. Single-family home sales were at a SAAR of 4.88 million — a 2.0 percentage point month-over-month decrease and a 0.6 percentage point year-over-year increase. The sales price for single-family homes increased by 6.6 percentage points to $266,200. Existing condominium and co-op sales were unchanged at a SAAR of 640,000 units, 1.6 percentage points higher than a year ago. The median existing condo price was $245,900 in June — up 6.5 percentage points from 2016. In the Northeast, existing-home sales dropped 2.6 percent to an annual rate of 760,000, up 1.3 percent from a year ago. Median price: $296,300, a 4.1 percent year-over-year increase. In the Midwest, existing-home sales rose 3.1 percent to an annual rate of 1.32 million. Median price: $213,000, a 7.7 percent year-over-year increase. In the South, existing-home sales declined 4.7 percent to an annual rate of 2.23 million. Median price: $231,300, a 6.2 percent year-over-year increase. In the West, existing-home sales dipped 0.8 percent to an annual rate of 1.21 million. Median price: $378,000 a 7.4 percent year-over-year increase. Existing-home sales are based on transaction closings from MLSs and include single-family homes, town homes, condominiums and co-ops.